When I met Joe Cajero three years ago and was introduced to his work, I realized immediately that he was a talented artist. His sculptures were at once intriguing and engaging, reflections of his observations, infused with his own particular sense of humor. This was particularly true of his Koshares, for which he was already quite well known. As he was a young man, not yet thirty, I presumed it would be interesting to watch his growth as an artist. But recently something has happened to Joe and his work, something that goes beyond mere growth, something which can only be described as a kind of quantum leap. His sculpture has taken on a soulful depth which is difficult to describe. The pieces, in addition to being beautiful in form and color, are so new and unexpected, that I find myself asking the obvious question; how in the world did you think of doing that? One of Joe’s most recent pieces, which he refers to as his “Relationship Piece”, (Relationship / Eternal Journey) is a wonderful example. The sculpture is two flowing forms that intersect briefly, then continue to flow away. The composition is two-sided, meaning to represent the physical world on one side and the spiritual on the other. This duality is most specifically noted in the head-dresses of the two figures. The night sky, full of stars, represents that part of the universe which is untouchable except through the spirit, while dragonflies and butterflies represent the physical earth in both the masculine and feminine. On the faces of the figures are altars, one on top of another, to signify the undiscovered levels of spirituality that may be accessed through life experience as well as prayer and the searching of one’s soul. On the bodies are more altars, representing life’s progression, often uneven. “Occasionally, along life’s way,” Joe said, “we receive unexpected blessings, which are indicated by clouds above some of the altar steps.” The recessed areas on the bodies represent the non-physical world, where spirits reside and guidance and wisdom may be discovered. The circles are spirits waiting to be made manifest. The colors, blending into one another, were chosen for their suggestion of love and intimacy, of Mother-earth and Father-sky, implying the warmth of love within a flourishing and sentient relationship. Joe Cajero, a native of Jemez Pueblo, has been pursuing art since his childhood, when his father introduced him to painting and his mother instructed him in clay sculpture. His work has been a staple of Indian Market since 1991, and he was recently chosen as one of 500 juried artists to have their work showcased at the Premier Events Show at the Kentucky Derby. 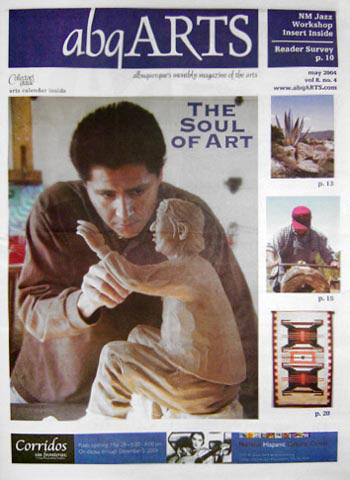 His work may be seen locally at the Museum of Indian Arts and Culture in Sante Fe beginning May 4th. He currently resides and works near Placitas. His work on the “Relationship Piece” has apparently had a positive effect on his life, for he is happily engaged to be married this fall.